So, you want to hire a patent attorney to protect your new innovation. It could be for AI, Blockchain, Machine learning, IoT, or some other cutting edge technology that you are developing. It takes around 3 years for a patent to be granted with hot technology generally being slower. According to US Patents and Trademark office 629,647 total patent applications filed in the year 2015. On average, about two thirds of those applications will issue eventually, but the likelihood of receiving a patent varies wildly with certain technologies having only a 10% chance of success. Although it might be impossible to find one who will admit it, but not all patent attorneys are equal. None can predict exactly how difficult it will be to get your application allowed after filing and each round of argument is expensive. Depending on the technology area, it can take 2-4 rounds of argument on average, but there are some who take far more or less with you paying for each round. So you better hire the best attorney who understands your innovation, business needs, and looks out for your best interests. But, how do you know which patent attorney or firm is right to hire for your innovation? Can you hire a attorney with any kind of background for your technology? Well, for starters, you need to hire a patent attorney who is registered to practice before the US Patent and Trademark Office by having passed the patent bar exam. To do so they need to have a technical background demonstrated by a degree in science, engineering, or equivalent to even qualify to take the patent bar exam. You can also hire a patent agent who is authorized to represent inventors pursing their patents before the Patent Office by taking the same patent bar exam and having a technical degree without also being a lawyer. Patent agents can administratively pursue your patent, but cannot represent you on appeal or in front of a judge so their help is somewhat limited. In this article, I am going to talk about these factors and share the strategies for hiring the best of the patent attorneys learned over two decades of practice in the field. Patent rights last for up to 20 years from the date the idea was first filed. And it could be 3 or more years before a patent is granted. Given such long time frames, it is in your best interests to ask your patent attorney to give a ballpark estimate of the costs that you would incur during this entire period. Often, attorneys simply quote the cost for drafting the application without the argument costs, government fees, etc. It is typical for an attorney to say it will be $10K for your patent, but they are forgetting the $2K government fee for filing, $4K per round of argument, annuity fees of $7-13K, etc. A more honest answer is $30-40K spread over the 20 year period of the patent term. How much do they charge to obtain a patent on my type of innovation on average? What techniques are used to minimize or avoid churn in the argument phase? What’s the cost curve over the lifetime of the process? Can you give me an estimate for this year and through expiration of the patent? Inventors have no idea what innovation tends to be expensive to obtain a patent and you would be surprised to find that simple technology is often more expensive to patent. The patent office favors complexity over simplicity, so easy to understand innovation often requires a deeper explanation of the underlying technology which leads to the counter intuitive notion that simple innovation is more expensive to patent. Similarly, utility patent fees (non provisional) differs from provisional patent fees as seen below. Not listed above are the maintenance government fees to keep the patent in force after allowance that accrue at 3.5, 7.5, and 11.5 years into the patent term and total to $12,600 for a large entity, half that for a small entity, and half again for a micro entity. 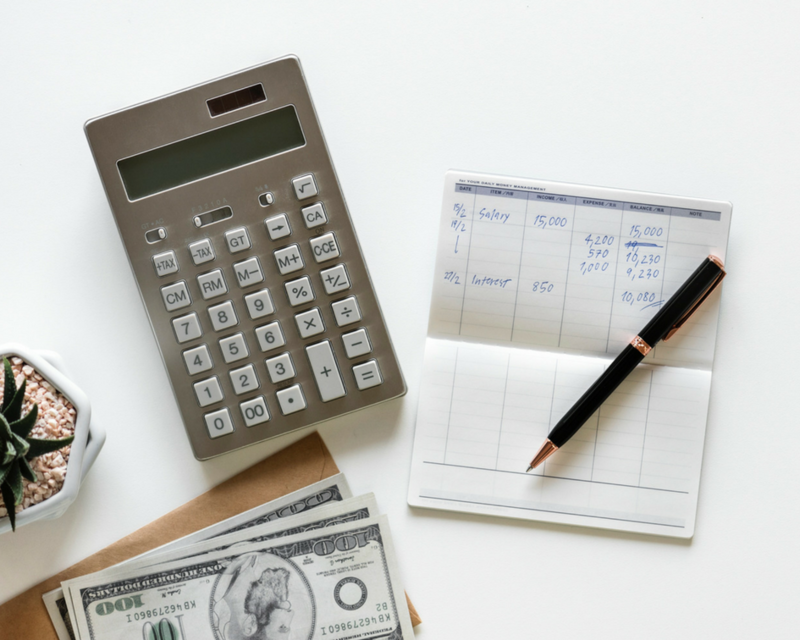 A good attorney can provide you with a complete breakdown of the estimated costs over the life cycle of your patent so that you can plan your finances before diving into the patent process. Many inventors and tech companies hire attorneys who charge low hourly fees, but the real analysis is more complex. Let’s say you have two attorneys, one charges $250 an hour while a more experienced attorney charges $500 an hour. Often the higher rate comes with better efficiency such that a better draft might be done in far less time. Both options typically will promise a similar writing cost of $8K-15K depending on technology area and complexity or lack thereof. While the lower billing rate may seem beneficial, this is a fatal mistake. Your patent application draft is often the most important part of the process so is not the place to cut corners. Most attorneys charge within 20% plus or minus to draft a patent application of each other regardless of hourly rates. The better draft from the more experienced attorney will typically have less difficulty gaining allowance at the patent office. That initial savings from a less experienced attorney will cost you as the patent application is excessively churned at the patent office. 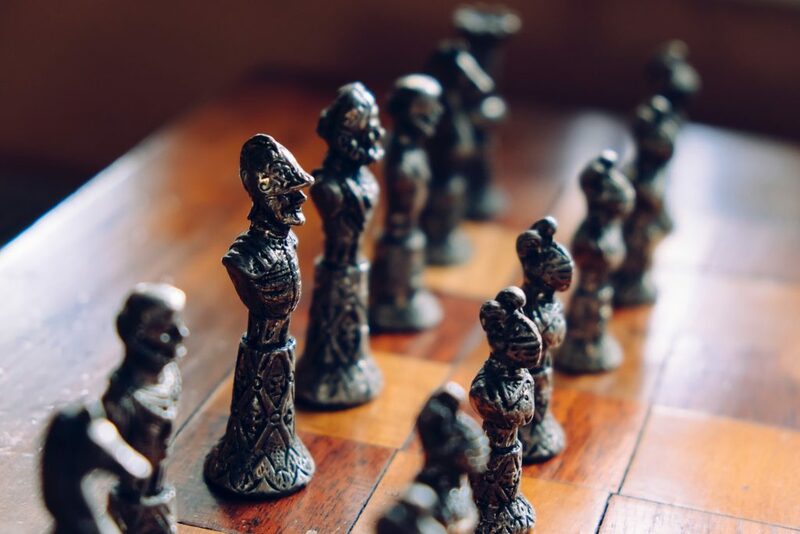 Alternatively, the flaws in your patent drafting could make assertion difficult or impossible such that the strategy may result in a worthless patent. Billing rate is a factor but total drafting costs, minimizing churn, and an enforceable patent are equally important in making a decision. Hiring a better patent attorney, while expensive hourly, is in your best interests and should be seen as an investment in your IP assets. Similarly, don’t just hire a patent attorney who picks up your phone when you call a law firm. Usually, these are the least busy ones and may not be a right fit as your patent counsel. Instead, seek a referral from a mentor or look up the firm’s website and find the best technology fit for your innovation. 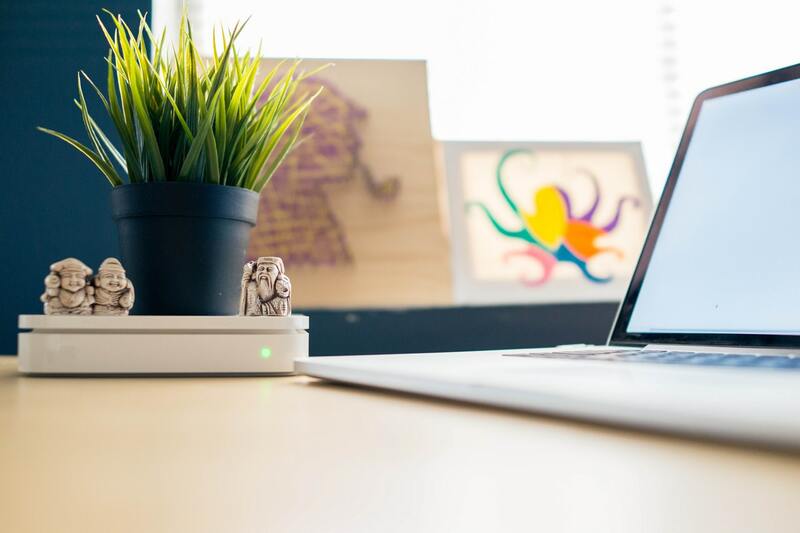 Don’t hesitate to contact them as most patent attorneys are happy to meet with you, free of charge for an hour or so prior to any commitment. Tip: Another way to find the best patent attorney in your field of invention is to look for people who are most active in the tech scene. Experienced and respectable attorneys often write papers, publish articles, conduct seminars, and speak at important events. You know how important it is to find a product-market fit before scaling up the business. Similarly, you should find innovation-attorney fit before allocating the low five figures for the patent filing. For example, you are an AI startup that is revolutionizing health care by reducing drug discovery times by predicting how molecules are likely to react with each other. That’s cutting edge AI. So, you would want to hire a patent attorney who has expertise in AI & healthcare that understands the technology you are developing and can draft a winning patent application. Because attorneys charge hourly, a patent attorney who is slow to learn your technology is costly and probably results in poorer work product. You are a company working on developing a blockchain based securities platform that connects issuers and investors in a peer-to-peer network with settlement times a fraction of the conventional wait times. Now, you would want a patent attorney who has experience dealing with blockchain & financial services to quickly understand your innovation over what the big financial firms have already filed in this space and, if so, what should your filing strategy be. Point being, hiring an experienced, reputable patent attorney is just not enough. 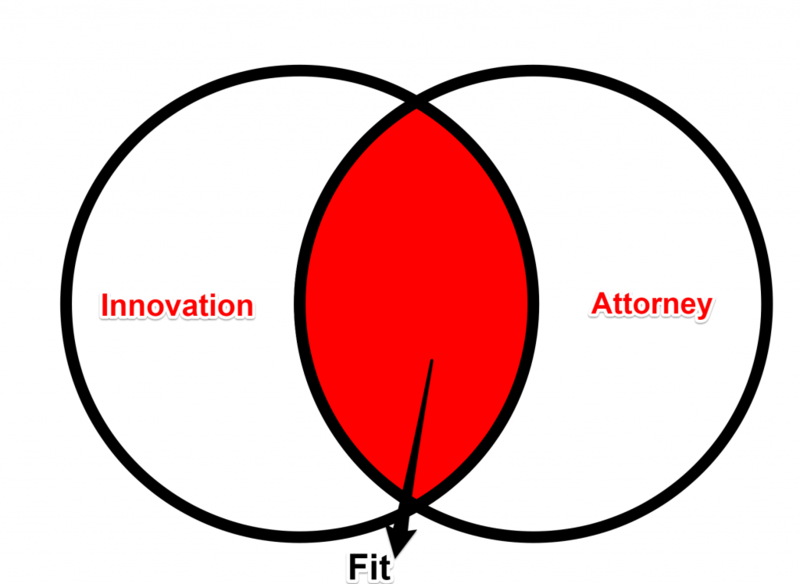 Finding an attorney that can quickly understand your innovation is key to efficiency. Does the patent attorney has expertise in the technology you are developing? How familiar are they with the part of the patent office examining your cases? How many patents have they filed in your technology area and what results are typical? If you lack inside legal counsel, can they describe the process using terminology you understand? Are they experienced working with companies of your size or funding cycle such that they can explain the strategies? Tip: Many law firms share their attorney profiles which includes their technical background and the areas of expertise. Additionally, you can look up their LinkedIn profile to get a sense of their technical background and experience along with the articles they have published. You would be surprised to know how many enterprises do not have a well thought-out patent strategy, impacting the success of their businesses. More budget is lost in pursuit of the wrong patent strategy than any hiring choice. The strategy joke in the patent industry is “If you are going to ask your attorney on how many patents you should file, your attorney would ask how many can you afford.” Seriously. Meaning, they be biased toward a gold-plated approach only throttled by your ability to afford it. (Patent attorneys tend to be risk averse). Plus, there is the obvious moral hazard with any vendor that realizes more profit in an aggressive approach. For example, attorney may file patents in areas that the patent office rarely rewards with a patent. Also, they may not invest the time and effort to draft a patent application that will fly through the process. Impossible patent odds with very determined effort will quickly zap your legal budget. There are tools available to empirically predict the likelihood of allowance for different technologies. Triangle IP for instance can predict the likelihood of allowance which will help you know your odds of getting a patent issued. A good attorney would listen to all of the above, ask questions about your business model, review the landscape to find out what your competitors are doing, what kind of patents are they filing, and would then come up with a pragmatic patent strategy to provide the most value for the least cost. Find the one who is empathetic to your success. For example, today AI and Machine Learning is being taken very seriously all over the world and is on the way to becoming a mainstream adoption in the years to come. 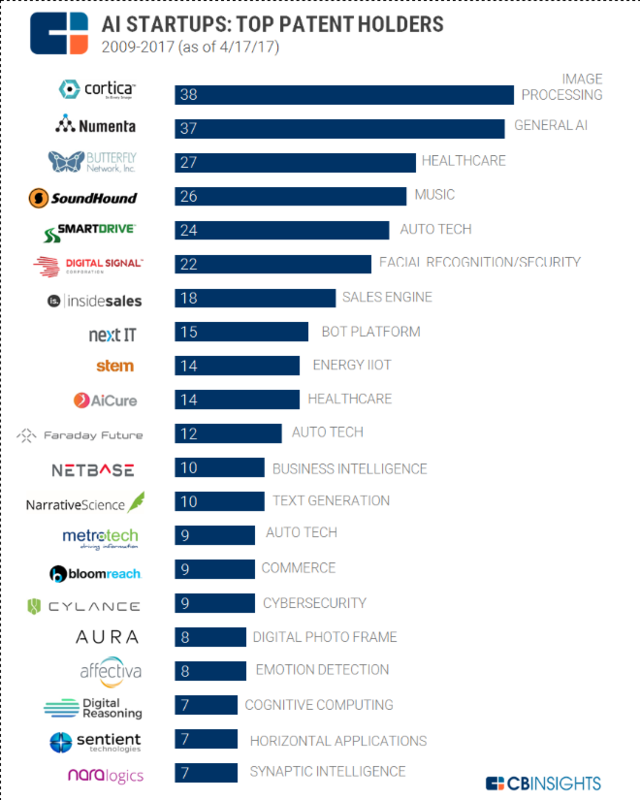 No wonder that startups dealing with AI technology in different domains are working fast to get patents to capture a lion’s share for their respective products in the market. 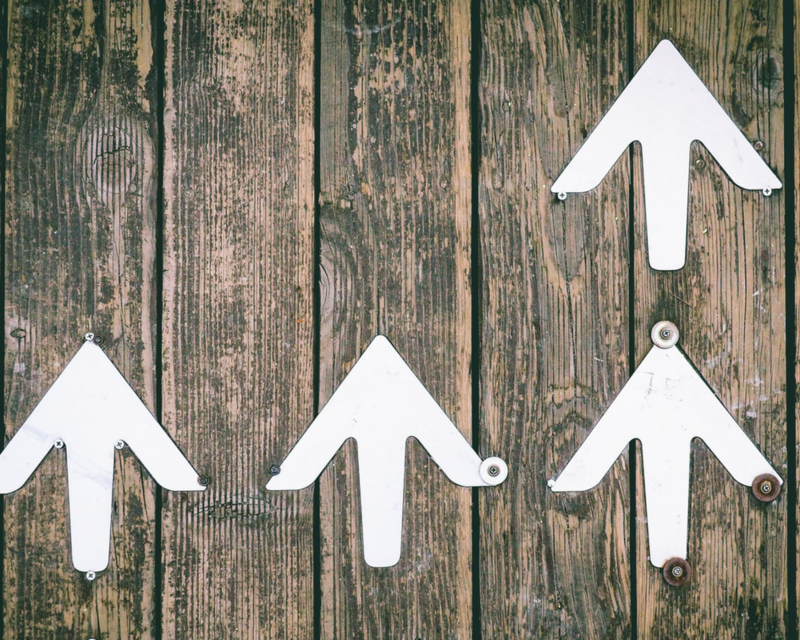 If you are a startup in the AI field, reviewing the above list for familiar competitors will provide a guidepost for how aggressively you might invest in capturing your innovation with patents. For example, if you are entering the cognitive computing space knowing that Digital Reasoning has 6 patents will signal that you may also want that many or even more if they continue to file patents. Therefore, knowing how many patents to file and the likelihood of success along with a strategy focused on achieving your goals inexpensively will provide the most value from your patent attorney. Patent attorneys are abundant and most perform within industry norms, but attorneys with high success rates are scarce. In difficult technology areas, it is not uncommon to find attorneys with substantially higher allowance rates with far less rounds of argument with the patent office. For instance, for a business method client we were getting patents granted over 90% of the time when the industry average was a mere 10%. Which means, from a yield perspective others had to file 10 patents to get one granted whereas we had to file 1.1 patents to achieve the same. In terms of costs, most counsel are within 20% of each other when writing a patent and doing each round of argument, but the better performing attorneys will always cost less when yield is taken into account. While a good patent counsel would transparently share success rates, few clients will even ask since they presume that all patent attorneys achieve the same outcomes. But that is not the reality. And this is where the Triangle IP tool can help you by accurately predicting the success rate of your attorney for your technology along with other analytics. Since success rate can swallow all other factors in choosing a counsel, find a patent attorney who has a track record of winning. There are some half million patent applications waiting for examination and even more if you count those being actively argued. Some patents are approved quickly while others take much longer. It depends upon many factors such as how simple or complex your innovation is, the quality of your patent draft, the advocacy skill of your attorney, the patent office stats for that type of technology, the scope of your innovation etc. 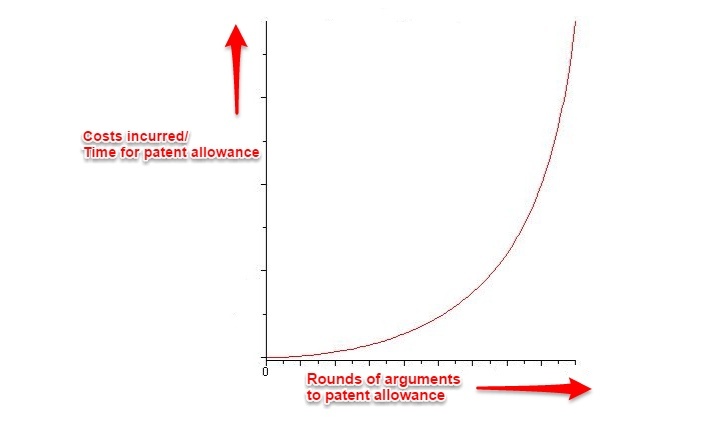 Having said that, the skill of your patent attorney plays a far important role in deciding how quickly you can get a patent with the best counsel averaging one round of argument until allowance. A genuine, skilled attorney can estimate the number of rounds to patent allowance and will see that your innovation is in condition for allowance within the estimated number of rounds. With each round costing $3-5K on average, saving one round results in substantial cost savings as well. For example, my patent practice involves taking over prosecution gone bad. In a recent case, prior counsel was still unsuccessful after 14 rounds of argument with the patent office costing the client over $50K in legal and government fees. For that same client, we averaged a little more than one round of argument and were able to resolve that over-churned case in just one more interaction with the patent office. The best attorneys understand the real issues and quickly get it so that they can be fixed for quick results. Meeting with the examiner, for example, is extremely helpful, but rarely done with paper argument being favored by those with worse statistics. But how do you know if your attorney is a skilled negotiator when arguing your cases? After all, the patent office does not provide these statistics. Triangle IP tool can accurately estimate the number of rounds to patent allowance for each of your cases. With the help of the tool, you will know how much effort to expect in arguing your case through the patent office.